Property Size 1,774 sq. ft. 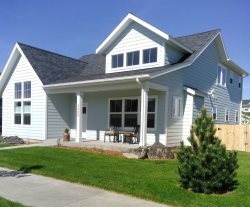 Enjoy the sweet life that Bozeman-Montana, has to offer in this newly constructed 3 bedroom, 2 bath home. This home has large, spacious rooms, wide halls & doorways, with a accents of Italy throughout! The Italian owners have incorporated touches of their home country with clean simple lines in furnishings, hand crafted dishes & glass ware, and vibrant artwork. The open kitchen/dining/living room is great for your group to gather in and the table extends to seat 6 people. There are numerous large windows to soak you in natural light without being concerned about your privacy! In the summer time, grill out on the back patio with views of the mountains while enjoying a breathtaking Montana sunset. The large master bathroom has a walk in shower and even a bidet! Queen beds in each bedroom ensure comfortable accommodations for up to 6 people in this home. This house has an access to a park just across the street, it is 1 block from the neighborhood park with playground and gazebo 2 blocks from the 100 acre Gallatin Regional Park park and the largest newly established Montana's off-leash dog park! This location is just few minutes away from the university, downtown, and recreation but gets you out of town quick if heading to the rivers, Big Sky, or Yellowstone. There is an attached 2 car garage for the guests to use. Kitchen Amenities: Gas Stove, Refrigerator with Ice Maker, Microwave, Dishwasher, Hand Blender, Coffee Maker, Crock Pot, Toaster. well stocked kitchen we like to cook while on vacation, so a well appointed kitchen is a must. Taylor was great and communicated excellent with us. Taylor was great to work with, lots of good email communication, and quick phone call with update right before we arrived. Felt that she was available and able to assist if we had questions/concerns. Wonderful home-away-from-home for our long weekend in Bozeman with family. Loved it. Will definitely stay there again. Jody has been professional, accessible, and friendly from the beginning. She is part of the reason we have already scheduled another stay in April and will try to stay in September, when we begin coming back.